Address: Timon, 3, Puerto del Carmen (Lanzarote), Islas Canarias. 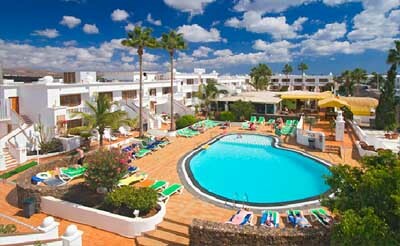 Montana Club is 5 minutes’ walk from Playa Grande Beach in Puerto del Carmen, Lanzarote. It has 2 outdoor pools and offers apartments with free Wi-Fi and a balcony or terrace. The complex has gardens surrounding the spacious sun terrace with loungers. There is also a poolside bar which is open until late. The restaurant and pool bar serves breakfast. All apartments at Club Montana consist of a twin bedroom, bathroom and a lounge with sofa bed and TV. The kitchens include a microwave and a kettle. The main strip of Puerto del Carmen, with its shops, bars and restaurants, is just 500 metres from the complex. Half board is offered in cooperation with nearby restaurants, offering a choice between Italian, Tex Mex and International cuisine. There is a golf course 1km away, and Lanzarote Airport is 5 km away. Please inform Hotel Suite Montana Club in advance of your expected arrival time. You can use the Special Requests box when booking, or contact the property directly with the contact details provided in your confirmation. All guests should contact the hotel directly if they anticipate arriving later than 23.00. The hotel does not accept American Express as a method of payment. Please note that breakfast is served until 12pm and can be adapted to individual requirements. When booking more than 2 rooms, different policies and additional supplements may apply.